Abby Grey met Tanavoli during the first of her many trips to Iran in 1960. She attended an exhibition at the Saderat Bank, organized by Tanavoli and his contemporaries, which displayed the latest developments in Iranian art. Myth captured Mrs. Grey’s attention immediately. She wrote in her diary, “I kept returning to a large painting in ink gouache, [sic] and gilt whose subject was intriguing.… [It] depicted three figures, one, the apprentice, holding a mallet, the other a legendary sculptor, Farhad. Protecting both was a gold and blue angel, wings open. For me it went right back to Arabian Nights. But of course it was a Persian tale. I felt I had to have it and purchased it on the spot.” This chance encounter began a long friendship between Mrs. Grey and Tanavoli, whom she would support throughout his career. 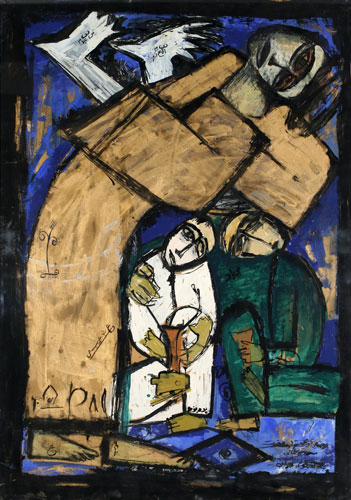 The NYU Art Collection includes approximately 75 works by Tanavoli, the largest number of works by one artist in Mrs. Grey’s collection. Dimensions 39 x 27 1/4 in.